With the Birmingham Popular Music Archive I’ve been inviting the public to contribute to an online database of music culture in Birmingham, by placing venues, artists, people or anything they feel relates to music on a map. You can see and add your memories to the map, here. 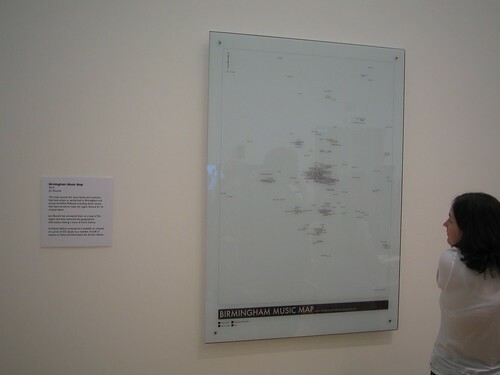 An editioning of the results so far was commissioned in the form of the Birmingham Music Map as part of ‘plug in’ an exhibition at mac curated by Simon Poulter. The exhibition has now finished, and the artwork (printed on toughened glass and around a metre wide by 1.4m high) is looking for a new home. I’m happy for it to be displayed in any public place as long as they will display an artist’s card next to it and look after it — it would be brilliant if it was mounted somewhere appropriate, but if you’re interested please drop me a line at jon@jonbounds.co.uk. If you’ve not got the room, poster/print copies are available, screenprinted on gorgeous white archival paper at B1 (707 × 1000mm /27.8 × 39.4in) in a signed and numbered limited edition of 100 copies. You can explore an online version here.